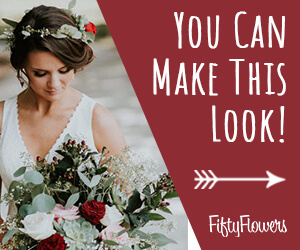 Quality florist foam is a must, since it really can contribute (or take away from) the life of your flower arrangement. I like Oasis (especially the Max-Life Foam). It mimics the cell structure of the flowers and actually increases the life of the flowers longer than plain water! Oasis foam comes in a large variety of shapes and sizes. 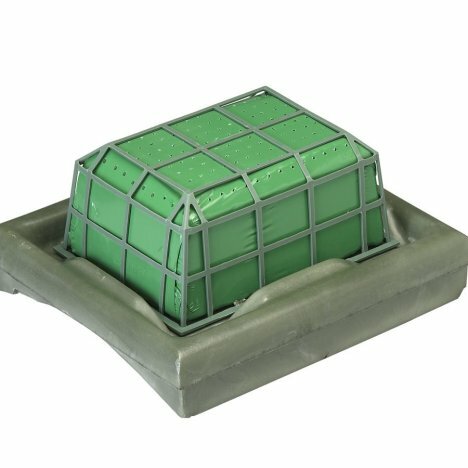 Cages are extremely handy, because they are filled with quality foam and surrounded by a gridwork that helps keep the foam from degrading, even if large amounts of flower stems are used. The plastic cages form a natural container (for flat use on tables) and have pre-drilled holes for easy hanging on doors, candelabras, pews, outdoor gazebos and wedding archways. Creative shapes can be formed by connecting the cages together with bent wires or wooden Cowee stakes. Large based forms with deep wells (for water storage) are excellent for sprays that spill over tabletops (as over the edge of the head bridal table) or for extra protection against moisture on wooden tables or altars. ALWAYS protect your tabletops or wood surfaces against moisture damage unless you want to pay a costly damage bill after the wedding is over! 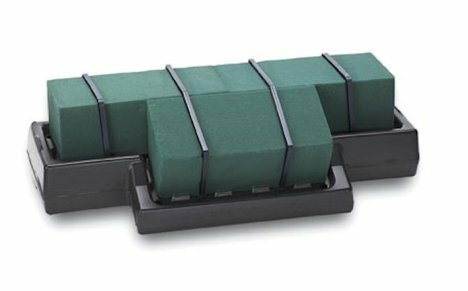 Larger containers like this one are designed to hold a large amount of foam, perfect for large flowing church cascades. The foam bricks are fitted into the base and then locked into place with heavy pins that snap and lock into place. These are referred to as spray bars or raquettes. 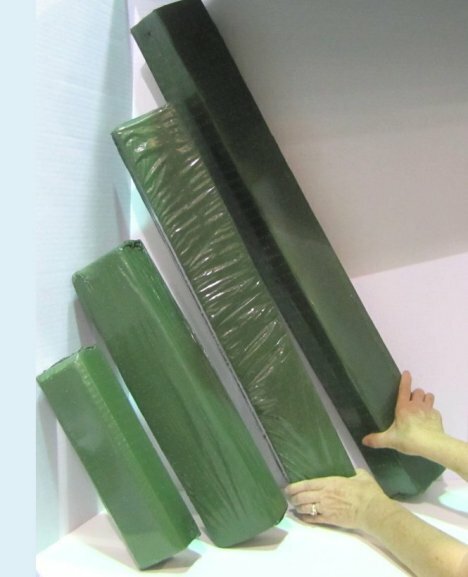 Long blocks of quality foam covered with a thin, dark green polyfilm perforated so water can seep in and soak the blocks. There is a bottom tray built in. 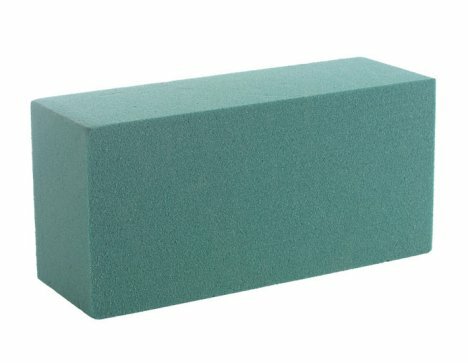 The long, narrow foam is perfect for the centers of long banquet tables, the edge of railings, up the sides of wooden wedding arches and more. They are very versatile and convenient to use. 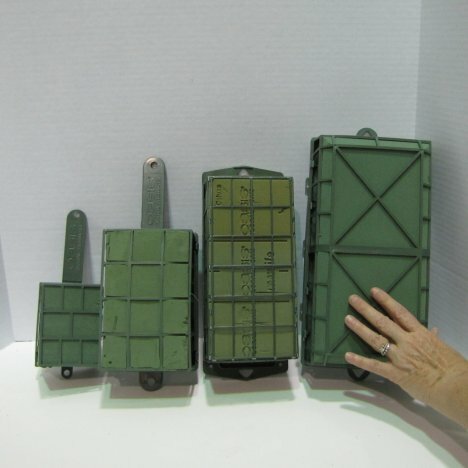 See an extensive step by step tutorial to see how easy these long blocks of foam are to design with. 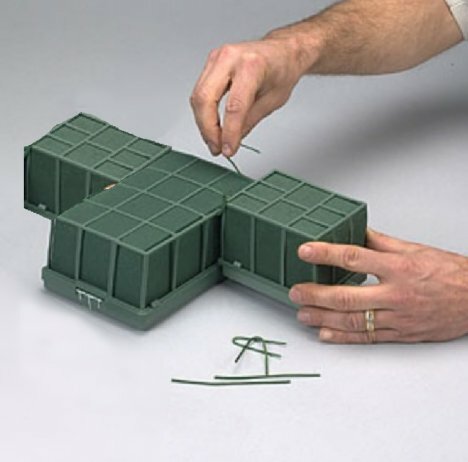 Of course, there are always standard blocks and bricks of MaxLife foam that can be cut to fit your specific container needs. 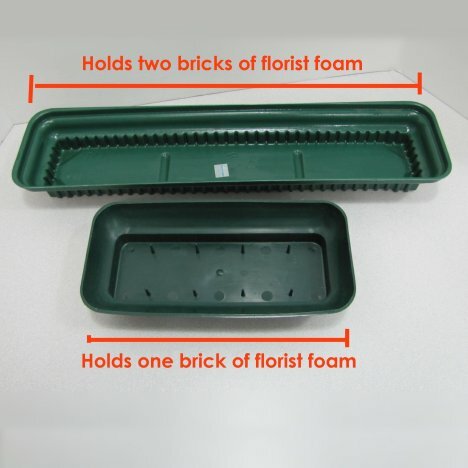 Florist use very inexpensive containers, designed especially to fit and grip standard blocks of foam. Notice the grids and the built in standing pins that help secure the foam in place.